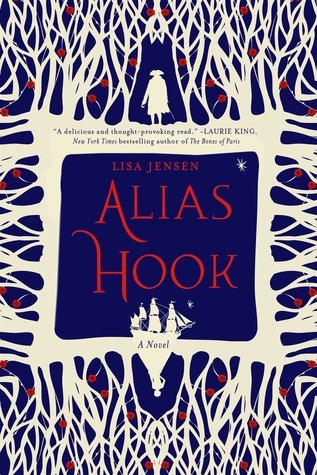 Alias Hook by Lisa Jensen. St. Martin's Griffin, 2015. Paperback. 368 pages. Most of you probably know the story of Peter Pan, or have at the very least seen the Disney movie version of Peter Pan. From those stories, we know that Captain Hook loses the fight against Peter Pan and is fed to the crocodile. But what we don't know, according to Alias Hook, is that he didn't actually die in that fight because Captain Hook is cursed to lived forever in Neverland and cannot physically die. It's really a pretty unfortunate situation, but Lisa Jensen tells the story beautifully. Alias Hook was a little difficult to get into at first, and there were a few chapters towards the beginning where I was still very unsure whether or not I wanted to continue on with the story. I plowed through, however, because the prose was lovely and premise fascinated me, and I must say that it paid off and I'm incredibly glad to have read this book. The world of Neverland that Jensen created is fantastic and so full of the magic and darkness that I crave so much in retellings like these. I adore what Jensen has created, from the nuances and 'rules' that Peter Pan has for the world, to the way in which Neverland exists and people can visit and the various inhabitants of the land. Jensen has captured a unique magic that combines the nostalgia and excitement of youth with the adventurous and difficult journeys of adulthood, including both love and loss. I really enjoyed exploring the different aspects of Hook's character that are often overlooked. He is jaded and hopeless, stuck in a land where he can never win, never leave, and never die. But at the same time, we are able to discern a small piece hope in him that surfaces at various moments throughout the novel that lend to some truly beautiful, exciting moments. I also loved Stella. She is a bold, exciting, and endearing character that I felt had a wonderful relationship dynamic with Hook. This story would not exist without Stella, and she is the perfect catalyst for ever aspect of change that occurs throughout the story. I loved the interactions between Stella and Hook, and their chemistry was simply perfect. They are two very different people, but they still fit so well - they bickered and they had different hopes and dreams, but it all came down to them at the end, and I think it was written wonderfully well. On the whole, I have very conflicting thoughts on this book. I loved the concept, the storyline, the worldbuilding - all of the major components of this book were brilliant, and it was whimsical well thought-out. This book contains a very elegant prose style, and because of this the writing did not always feel exceptionally accessible. I kept having to reinforce my reading and make sure I was focusing on the story and not zoning out instead. But... although the prose is somewhat difficult to connect with, it is also very beautiful at the same time, and by the end of the book I realized that I didn't mind the extra effort involved at all. There were many times when I wished to highlight or mark various passages, and I felt very moved by many of the emotions and events Hook undertook. Overall, I am giving Alias Hook four stars! I truly cannot wait to read more from Lisa Jensen. And if you are looking for even more Peter Pan-inspired stories that are absolutely gorgeous, I would like to take the time to highly recommend you go check out Tiger Lily by Jodi Lynn Anderson! This sounds really intriguing. It's nice that you could enjoy even though you had some issues. It sounds lovely. Great review!